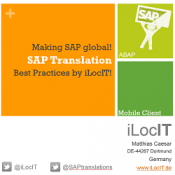 SAP is looking into ways to make text creation and localization easier. 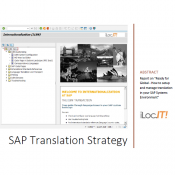 For SAP HANA Cloud, a BETA of the so-called SAP Translation Hub already exists. What this video to get a first impression of what Translation Hub does and how it works. Another initiative is to make parts or all of Translation Hub also available to SAP customers who did not migrate to HANA yet. In July I was invited to a workshop to design Translation Hub for ABAP in Eclipse. This entry was posted in ABAP, SAP Translation Setup, Tips&Tricks and tagged ABAP in Eclipse, HANA, SAP HANA, SAP Translation Hub, Translation Hub, Translation Hub for ABAP in Eclipse. Bookmark the permalink.